While I may not be a New Years Resolution maker, my competitive nature means that if I see a challenge, I’ll probably join in. 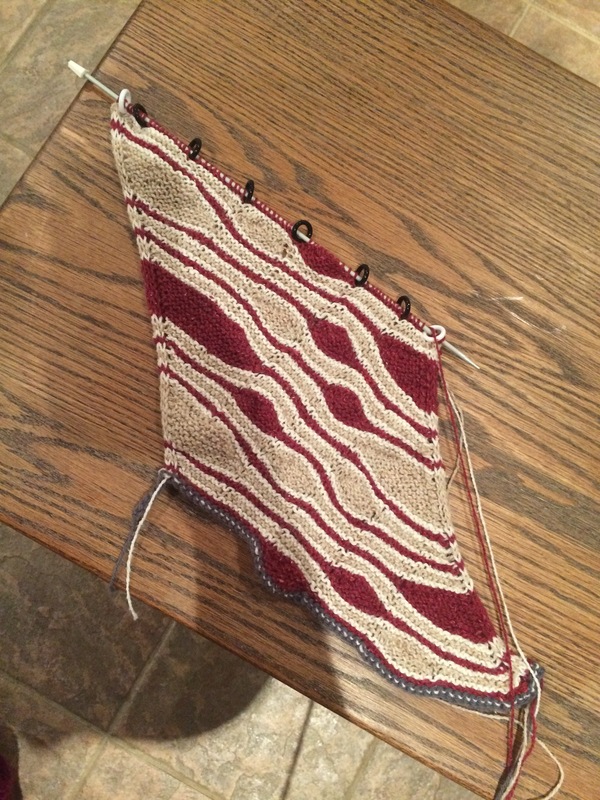 Case in point: The Ravelry Project Challenge. Launched this year, Ravelry has let users set a goal for themselves in the year, and this is tracked from your Projects tab in the Notebook. Being advantageous, I’ve set myself a goal of completing 24 projects, or 2 per month. As of right now, I’m behind in the goal, only finishing my Lisa Beret in January. I’m not feeling too discouraged, however, as I am working on two pairs of socks, both of which have sock 1 of 2 complete, and I’m making very good progress with my Madewell cardigan and my Bigger on the Inside shawl. As well, with February rolling around, one of my LYSs may soon be launching their annual Yarn Challenge, giving me a project to work on and complete throughout February. Long story short: I have a few things on the go and lots of knitting to do. Are you taking part in the Ravelry challenge? What goal have you set for yourself? A few weeks ago, while updating my Needles and Hooks stash on Ravelry, I went through my projects and updated the yarn used. In doing so, Ravelry can see how many metres (or yards, if you prefer) you have used in your projects, and at the very bottom of your projects page, it tells you how many metres are in all of your projects combined. The last time I looked at this number, I had used over 16,000 metres, or 16 kilometres, and I wrote a post about how far that was exactly. Feeling rather Type-A, I went through all of my projects and updated the yarn used wherever possible. If the yarn remnants was close by and not entered in Rav, I updated it. I didn’t dig or spend hours searching for yarn deep in the bowels of my stash, but if it was handy, I updated. This brought my grand total of ‘Metres Used’ to 25,477m (25.4 kilometres or 15.7 miles). I’ve knit more than a half marathon. Just let that sink in. Just another one of the fun features that Ravelry boasts. I think it’s safe to assume most knitters know about Ravelry. If you don’t, stop reading this post and get yourself an account. Ravelry is the largest and best online knitting community website. It’s social network meets pattern database meets personal database. In short, it’s awesome. Everyone uses Ravelry in their own ways. I use ‘My Notebook’ feature quite frequently, adding WIPs and tracking favourites. I’m not as faithful with the stash feature, but it is handy if you’re looking for project inspiration; you can see what other knitters have made with the same yarn. This isn’t what I want to talk about today. Today I want to sing the praises of the Needles & Hooks tracker. I was wanting to start a new project; pattern was printed, yarn purchased, but I realized I didn’t have the right circular needles for the project. In fact, I needed four different needles, different sizes, all 16″ in length. Many of you may be thinking I could use DPNs for such a project, but I prefer circular, and I digress. As much as I LOVE new needles, my bank account just couldn’t face this investment. My solution? I turned to thrift shops. A few weeks ago, at one of the better shops in the ‘hood, I hit the motherload. There were at least 15 sets of circular needles, all various sizes and length, and the shop was asking a whopping 99¢ each. This is where personal preference comes in. The vast majority of the needles appeared to be Aero, or something very similar, and I have a soft spot for this workhorse needle. When I started knitting, Grandma passed along her knitting supplies, many she acquired from her mother-in-law, my great-grandmother. Many of the needles I inherited were Aero needles, and after decades of use, they are still going strong. I may be a bit of a needle snob, but I won’t turn my nose up at Aero. Seeing a wide selection of affordable needles, in a brand that I can appreciate, I was quite happy. Enter the Needle & Hook Ravelry feature. Using the feature is so easy and super helpful. I have managed to keep this feature updated with the needles I’ve purchased, and in that thrift shop, I was able to pull up Ravelry, look at what needles I already had, and selected which ones to buy. Some were excluded because of duplication and some were excluded because I didn’t like the look of the cord, but I walked out of the store with 6 new needles for $6 (plus tax). I’ve included details about the needles themselves. Now, admittedly, this is super nit-picky, but I like being about to pin-point which needle is which. Ravelry has many wonderful features, some I’m sure I haven’t have the chance to use yet, but I would encourage any knitter to take advantage of the Needles and Hooks feature. You may never know when you’re faced with the chance to buy a lot of needles and need to know what you already own. This is totally the knitting equivalent of judging a book by its cover, I realize, but it is a sin I am guilty of. During my lunch hours, it’s not uncommon to find me at my desk reading, perhaps watching a safe-for-work episode of a TV show, all the while keeping my hands busy by knitting. I’m also frequently browsing Ravelry’s ‘Hot Right Now’ patterns. A few days ago, as I was mindlessly clicking through the patterns, I realized how the featured picture of the pattern completely impacts whether I’ll click on the pattern or not. Artistic, engaging image with the lovely yarn shown off in an aesthetic fashion? You bet I’ll click on! Poor quality, dark shades, hard to make out the stitches, and I find myself even questioning how this pattern is currently ‘Hot.’ The same goes for overly artistic photos where you can’t even tell what the project is – if it’s hard to discern the pattern, I have zero interest in the project. While knitting is very much a tactile art form, the feel of the yarn, the movement of the stitches, it is also extremely visual. 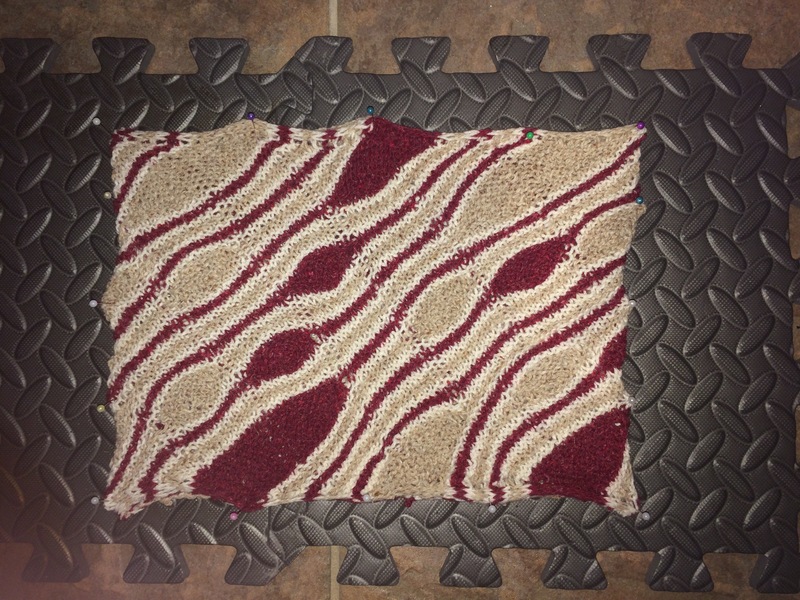 Even though you likely shouldn’t judge a pattern by its Ravelry picture, it’s a sin I’ll continue to commit. Made my way to LYS and purchased the Yarn Challenge kit. The yarns are lovely: red, taupe and beige. Now comes the hard part, what to make with it. Awesome! I’m so glad I found the Mixed Wave Cowl pattern on Ravelry. It’s perfect for this yarn, a fantastic way to truly highlight the three yarns of the Yarn Challenge. I have the yarn, the needles, the pattern; I’m ready to cast on! Gah, so that didn’t go as planned. Here’s a tip, Lisa. Read the whole pattern. Like, all details. Let the frogging commence. Frogging complete. Cast on complete. First row knit. 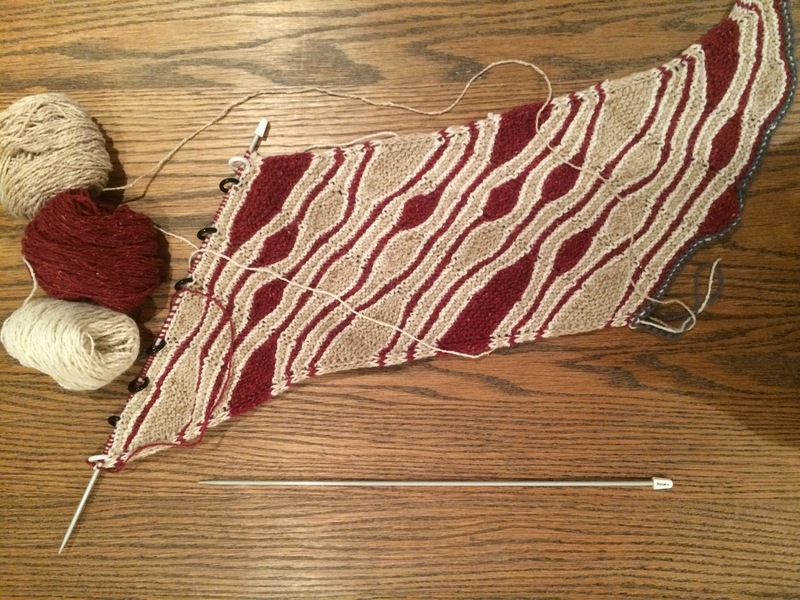 Now onto short rows… wait… huh… I still can’t visualize what to do here. I get the general idea – you’re using short rows and alternate colours to create this really interesting and unique striped pattern. That I get. These instructions, though… Maybe it’s just because I’m not comfortable with the wrap and turn method. Yeah that’s it. Well whaddya know? Those Ravelers and the designer were right… just do it. I’m doing it, and a few repeats in and it looks like it’s supposed to look! Maybe all that math the designer did actually makes sense… almost foiled by math once again, but not this time! A day off work and four hour car ride = lots of knitting time. Mixed Wave Cowl, let’s do this. I’m actually feeling so confident with this pattern, a pattern that only a few short days ago I had no faith in, that I’m now able to work it without referring to the written directions. Lesson learned: read all instructions. Trust the designer. Trust other Ravelers. Mixed Wave Cowl grows, both in length and in my overall love for it. Couch, knitting, Law and Order. I see you, Mixed Wave Cowl. Break out the measuring tape. 55cm! I’m at the right place in my pattern to justify casting off. It is 5cm shorter than the recommended length but it’ll stretch. Stupid provisional cast on. Grumble grumble. Why yes, that is the cowl, grafted, ends woven, and blocking! I’m sorry I ever doubted you, designer. The initial frustrations I felt three weeks ago was worth pushing through to get this as the final result. Just trying it on for good measure. Yup, still in love with the final result. So much cowl love.